As I was clearing out my cupboard before the start of term, I came across an old battered document. 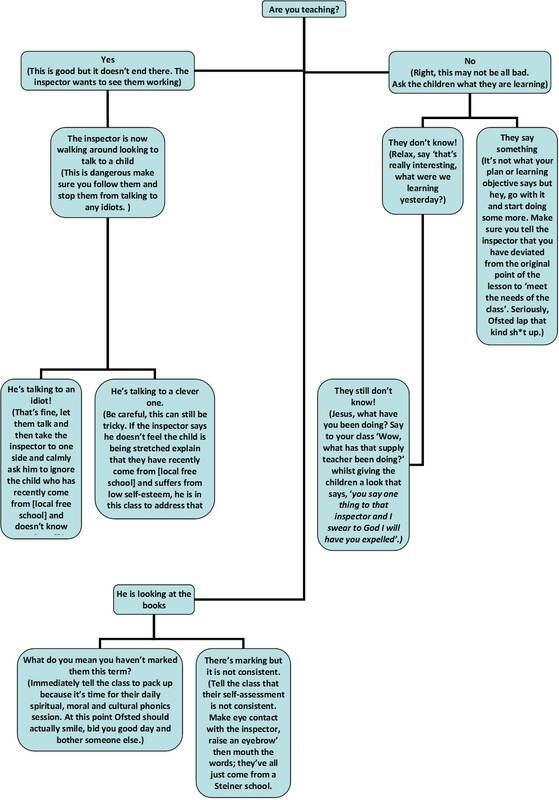 A tried and tested guide for getting through a full ofsted inspection. I have included some of the main highlights. Do feel free to use them, share them maybe even improve upon them (that last bit is highly unlikely, I think you’ll agree). Enjoy. An Ofsted inspector will at some point attempt to catch you off-guard by asking you questions. Be warned: some of these questions may be about school policy or procedures or in the worst case scenario; about something they saw you do or heard you say. Ignore and continue about you business. Pretend you are a first aid trained member of staff, say there is an emergency that requires your attention and leave using the nearest fire escape. State that they are in breach of their inspection procedures and contact your union. I’m sorry, I’m on a peer observation placement from another school. I teach at [insert name of local free school]; what is standards? I’m sorry, I’m on a peer observation placement from another school. I teach at [insert name of the newly opened Steiner academy]; what is a curriculum? I’m sorry, I’m on a peer observation placement from another school. I teach at [insert name of local academy that just went into special measures]…what is learning? State that you are visiting ‘role play’ actor and you are here to stage a lock down procedure for the school. Then, calmly push the inspector to one side, scream and smash the place up until you are physically removed by management. It is every class teacher’s nightmare: you are killing time during Literacy by playing hangman, shouting at your class, or telling them to copy out some text from Gove’s bible while you buy a wetsuit on ebay and an inspector walks into your room. It is important that you do not panic. We all know that teachers and support staff feel the stress during an Ofsted inspection. But, no member of staff is more stressed than the Head Teacher. It may not look like it and he may hide it well with his sharp suit and those shiny shoes, but trust us, your Head Teacher is barely keeping it together. The fact that spotify is blasting from his computer speakers in his office is not due to the fact that he loves new post-modern-pre-punk-underground-ska-dub-step-beatnik-New-York-London-rock; it’s because he is crying. Crying, because in this dark hour, he has no faith in himself, his SLT, and least of all: any hope in you. His mortgage depends on your lesson and after reviewing your performance management sheet on the T-drive he has just realised he really shouldn’t have re-mortgaged in order to re-do the bathroom. My APS is looking great chief! I’ve just readjusted my targets because every child has already met them…except that new kid who has been home schooled for the last two years..
Just thought I’d let you know my Y1 class know all 687 phonics sounds! I’ve dealt with that thing, so don’t worry. You know, the thing? That we didn’t want going to the papers? With the boy and the fox…on facebook? Well, it’s sorted, I’ve shut it down. Great assembly Boss. Everyone from Reception to Year 6 got it! This will make your Head Teacher feel at ease and allow him to confidently continue pulling the wool over Ofsted’s eyes. Next Article …but some of my best friends are dyslexic! Needed on a weary, dark Friday evening!